I have created a thread regarding a permission which I think raises privacy issues. There are many apps that can read your browser(s) history and bookmarks. 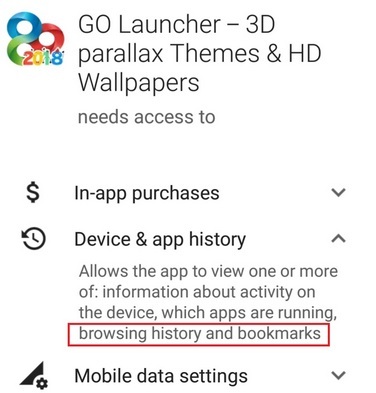 A launcher reading browser history and bookmarks is quite suspicious. After seeing some apps needing this permission, I am more cautious and I avoid installing such apps. Note: The red colored filled rectangle is actually an antivirus app which I guess uses the permission to scan and prevent infected webpages. 2. Is it safe to have system apps (some of them in the screenshot) read your browser history and bookmarks? 3. Any way to deny this permission for system apps as they can't be uninstalled (and some can't even be disabled - eg: Camera test app)? 4. 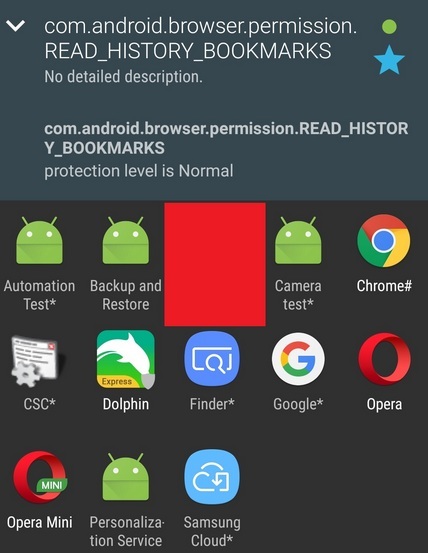 When does any app having this permission can actually read browser history and bookmarks (when the app is running or even when a background service of the app is running)? 5. Last and the most important question: Can the apps having this permission actually "send" the browser(s) history and bookmarks back to a server? They want permission to read your browser history an bookmarks, so they know where and when to target you for advertising!